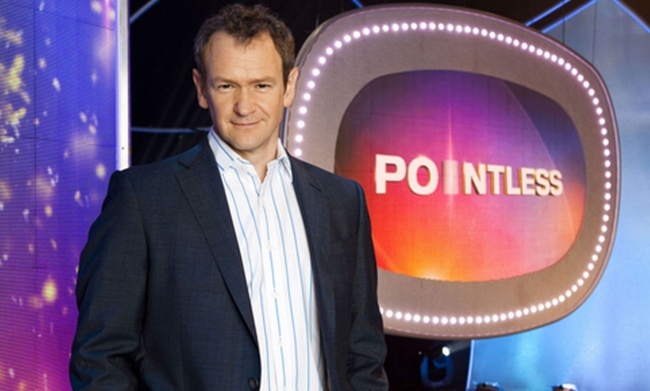 On the superb BBC1 quiz show, Pointless, I contend that co-host Alexander Armstrong perhaps a little over-effusively enthuses on the contestants’ competence after their failure. No pair of entrants appearing in the 600 aired episodes has ever fallen short of “great contestants”, no matter how fist-grindingly dreadful they may have been. This is part of what makes Pointless so absolutely lovely, in an age of quizshowing that otherwise focuses on humiliation or treachery. It’s also entirely daft. “Great Contestants” = Really astonishingly terrible contestants, who likely scored 200 in the first round, two days running, and uttered phrases like, “The 1870s were before my time,” and, “Words ending in ‘EART’ isn’t a good subject for me.” That they found their way to the studio without accidentally strangling themselves with their own arms is of note. “Brilliant Contestants” = Pretty poor contestants, unlikely to have displayed any knowledge, who most likely only got through to the second round after some “Great Contestants” inadvertently impaled themselves on the podium. “Really Brilliant Contestants” = Okay-ish contestants, who knew a right answer that scored under 50. It was probably about football, which was, when they were asked what subjects they’d like to see come up, their only response. “Properly Brilliant Contestants” = At this point the “properly” introduces the notion that there may be some credibility to their performance. These contestants potentially knew the location of a country on the planet, or the name of a film director. Where some Brilliant Contestants had said, “Well I don’t really follow politics” when asked to name a British Prime Minister, a Properly Brilliant Contestant might remember someone other than the present incumbent. “Really Properly Brilliant Contestants” = Quite good contestants.